In an ever-changing and increasingly digital world, children understanding how to be safe online is increasingly crucial. Whether it be using computers or laptops, tablets or mobile phones, television or iPods, children can connect to the internet – and interact with the entire world – in a seemingly endless number of ways. At Carrfield, we recognise that the online world brings enormous, exciting benefits to the lives of the children: research, communication, entertainment and information that could only be dreamed of twenty years ago are now available with a few clicks of a button. However, it is important that children recognise and understand the dangers that can be found online and can take steps to avoid, adapt to and report these. If you have any concerns not matter how big or small, or even if unrelated to online safety you can contact us here. Wherever possible, we engage the children at Carrfield with special events to celebrate and promote understanding of e-safety. During the 2016-17 academic year, the children took part in Safer Internet Day to further develop their understanding of the power of a single image and when it is appropriate to share these online. 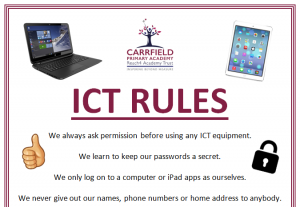 Each class in school produced a tweet from the school’s Twitter account – @CarrfieldPA – that gave advice or promoted an aspect of e-safety; whichever class achieved the highest number of likes or retweets would be declared the winners! The tweets can be seen by clicking here. If you have any concerns about your child’s use of ICT – in or out of school – or would like advice about how to help your children stay safe online, please come into school and speak with your child’s class teacher, Mrs. Ramsbottom or Mr. Morton who will be happy to help. Alternatively, the following websites provide a multitude of resources, games and ideas about how to inform yourself about e-safety and start those conversations with your child. 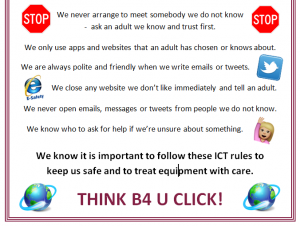 ThinkUKnow – this is run and updated by CEOP (Child Exploitation and Online Protection Agency) and features the “Report Abuse” button which children can use to get advice around e-safety issues and, if necessary, report e-safety crimes to the authorities. It also features sections for teachers and parents as well as different sections for different age groups of children. NSPCC Online Safety – advice and support for parents about how to keep children safe online. BBC Stay Safe – child-friendly site with lots of advice and support for children from a trusted source. 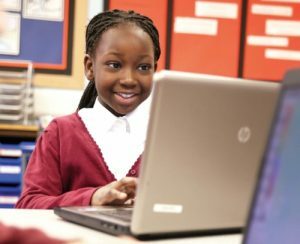 UK Safer Internet Centre – sections for teachers, parents and children of different ages from the organisation that runs Safer Internet Day every year. National Online Safety Newsletter – Monthly newsletter with the latest online safety news, practical advice and tips for keeping your children safe online.